And the girls are just as same. It’s “pass the fasssooolaaadaaa”, “my fasssooolaaadaaa is too hot” and so on throughout the meal. It’s worth starting with dried beans if you have time. 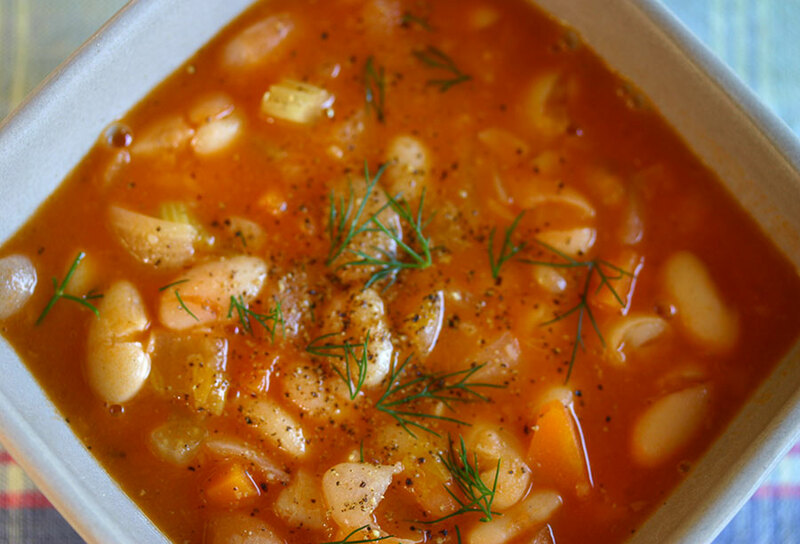 The bean cooking liquid enriches the soup, adding a bit of thickness to the broth. Adding more oil at the end of the cooking is important too, as it gives the fasoulada a lovely creaminess. Drain and rinse the beans, if using dried. Pour them into a large, heavy pot and fill with water. Bring to a boil, skimming any foam that forms on the surface. Lower the heat and cook the beans until just tender. Drain the beans, reserving the cooking liquid, and set aside. Wipe the pot clean and return to the stove. Add half the olive oil and heat over a medium flame. Sauté the onion until softened. Add the carrots and celery and cook for several minutes more. Stir in the tomato paste, then add the beans. Pour over any cooking liquid, topping up with additional water if needed. Cook for another half hour until the beans are very tender. Add the remaining olive oil and cook five minutes more. Season with salt and pepper to taste and garnish with fresh dill.